Thirty years after the original group's Eurovision win there are two acts vying for the right to use the name. Cheryl Baker, Mike Nolan and Jay Aston have performed at a packed London Palladium under the name The Original Bucks Fizz. The fourth member of the original line-up, Bobby G, recruited three new members including his wife Heidi Manton, who now owns the copyright of the name Bucks Fizz. Both sides object to the other's band name. At the Intellectual Property Office in London, Cheryl, Jay and Mike's solicitor Dean Dunham said the use of the name Bucks Fizz by Bobby G, real name Robert Gubby, "misleads" the public. Cheryl's agent has received emails and calls from fans who booked tickets for Mr Gubby's band expecting to see the original members, the hearing was told. Ian Stocker, who runs a fan website, heard similar complaints. Mr Dunham gave examples of adverts with a strapline mentioning the 1981 Eurovision win, and using a photo of the original band, for appearances by Bobby G's act. 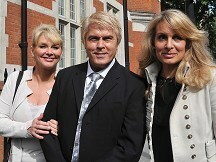 He said: "The public perception of the words Bucks Fizz is simply the band that consisted of my three clients as well." Speaking beforehand, Cheryl said: "We do proper theatre shows and we're on TV, we've got a new album coming out. It's actually the proper Bucks Fizz that you're seeing now." The trio maintain that the name is key to their livelihoods and Cheryl accused Mr Gubby of "trading off their success". Mr Gubby said he felt entitled to claim his band was the "original" act because it had a "direct connection" right back to when it was founded.